It's been a milestone year for the University of Houston-Downtown (UHD). A new president, a historic $10 million naming gift, and the planning of a new academic building are transforming the University into a bigger, bolder institution of higher learning. UHD will soon commemorate recent successes while focusing on its future during the weeklong celebration, Invest in Blue. From Oct. 21 through 26, the UHD family and Houstonians will come together for a variety of events addressing themes of University pride and progress. 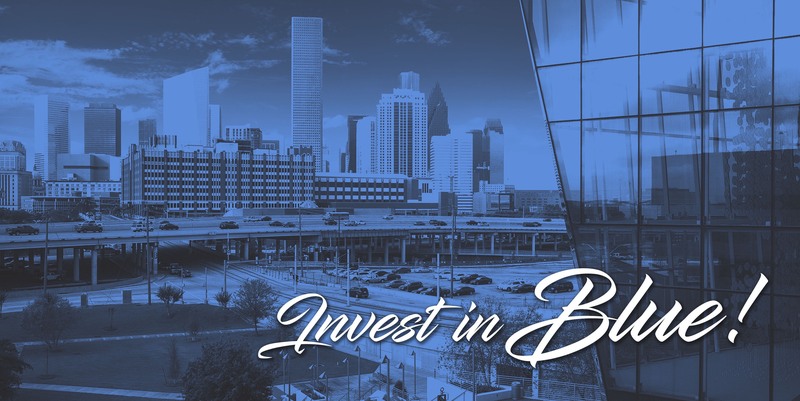 Invest in Blue highlights include the first Report to the Community from Dr. Juan Sánchez Muñoz, UHD President, on Oct. 23. This event will be live streamed starting at 2 p.m. The following day, Muñoz hosts community members at a naming ceremony for the Marilyn Davies College of Business, and a Vision and Welcome Event outlining UHD's journey forward and how Houstonians can support its growth. Local entrepreneur and UHD benefactor Marilyn Davies will be in attendance at both of these events. "Invest in Blue offers members of the community opportunities to learn about this great institution and to be a part of its growth," Muñoz said. "We look forward to reflecting on the University's successes while setting new goals as well as welcoming Houstonians to our campus for events that spotlight UHD's excellence in academics, community service and research." • Oct. 21 (9 a.m. - 2 p.m.): UHD Open House and Homecoming in the Parking Lot behind the Student Life Center. Community members can celebrate UHD pride during a TailGatoring event with food, fun and games. • Oct. 23 (noon - 1:30 p.m.): UHD Retirees Luncheon in the Welcome Center Tour Room. The University welcomes back longtime friends—who served 20 or more years at UHD—to this luncheon that precedes the President's Report to the Community. • Oct. 23 (2 - 3 p.m.): President's Report to the University Community in Robertson Auditorium. President Muñoz will deliver his first community address to faculty, staff, students and the community, which report will detail the University's goals heading into 2018 while spotlighting major accomplishments since his arrival in April. A reception will follow the report on UHD's South Deck at 3 p.m.
• Oct. 24 (4 - 5 p.m.) Naming Ceremony for the Marilyn Davies College of Business at the Shea Street Building. Community members, faculty, staff and students will gather to celebrate Marilyn Davies' historic gift to the University and the college that now bears her name. An unveiling ceremony will reveal new signage visible to Houstonians in and around the downtown area. • Oct. 24 (5:30 - 7:30 p.m.) UHD, Here We Go! Vision and Welcome Event in the Welcome Center Lobby. President Muñoz will detail UHD's goals for growth and how Houstonians can help the institution as it serves both students and the community. UHD, Here, We Go toward the success of our students and campus growth. • Oct. 25 (11 a.m. - 1 p.m.) Pizza with a Purpose in the Welcome Center's Milam and Travis Rooms. The UHD Community is invited to share pizza and participate in a community service project to create blankets benefiting Houston-area communities. • Oct. 26 (5:30 - 7:30 p.m.) Alumni Fall Social Series at the O'Kane Gallery. UHD alumni will gather for an evening of art (featuring Rio Grande Valley artist Nastalia Anciso) and conversation with President Muñoz.